President Barack Obama has always been high on our celebrity BlackBerry user lists. A long time BlackBerry owner, Mr. Obama has never really tested out the waters for another platform (as far as we know). While out on the campaign trail this weekend, Obama actually ran into a bit of trouble when trying to place a call from an unfamiliar iPhone. According to the Washington Times, President Obama was supposed to call some workers with a quick thank you. He was handed an iPhone, but couldn't quite manage to dial out. After some initial confusion Mr. Obama said "Oh, I got to dial it in. Hold on, hold on. I can do this. See, I still have a BlackBerry." 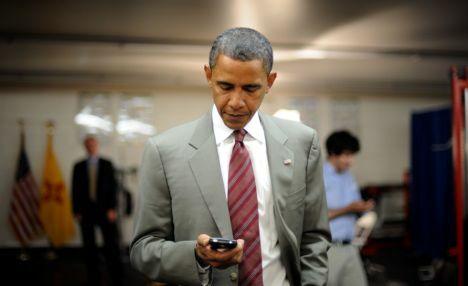 This just goes to show that a BlackBerry is definitely still the best choice of phone for the President. I'd bet that he'll be picking up a new BlackBerry 10 device too so he can just get things done. I'm thinking he's a full QWERTY guy.